Shopping for Gundam Action Figures? Action figure based on the Japanese anime series Mobile Suit Gundam 00. Features all-new design, materials, and engineering for enhanced poseability! New features include a ratcheting GN Drive core and poseable side binders. Loaded with swords, optional hands, and other accessories! 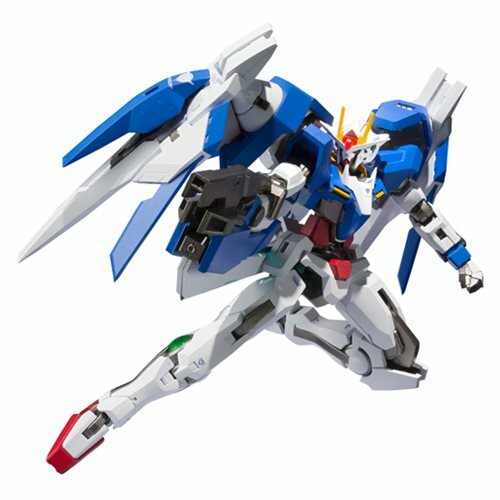 From the Robot Spirits series, this Gundam 00 Raiser with GN Sword III Robot Spirits Action Figure features all-new design, materials, and engineering for enhanced poseability! An excellent balance of die-cast metal and plastic parts gives it satisfying heft, while new features like a ratcheting GN Drive core and poseable side binders increase your display options. The set includes the 5 1/10-inch OO Raiser, the O-Raiser, a GN Sword III and beam effect parts, two GN Sword II and beam effect parts with sword connector parts, two GN Shields, two saber grips, two beam saber blades, two types of option hands (L/R), a GN Sword III connector for the O-Raiser, and a custom stand with base, connector, and display arm. Ages 15 and up.